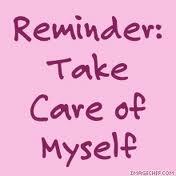 Just a little reminder; Take care of yourself! Whether it’s cancelling that night out to go to bed early, making yourself a nutritious meal to make up for the lack of vitamins, giving yourself a pamper and foot massage, leaving that pile of work you have to do for a bit of time out for reading or a walk. These are all little things we take for granted and dont do often enough. What is your body telling you? what do you need?